In a shocking development, Roman Reigns has just been revealed as the final pick for SmackDown Live. The Big Dog took to Twitter and commented on his shocking move to the blue brand. With the Superstar Shakeup having reached midway, WWE's official website made a huge announcement regarding the SmackDown Live edition of the Shakeup. Reportedly, Vince McMahon was going to introduce the biggest acquisition in the history of SmackDown Live. As the live crowd and the millions watching at home looked at Vince McMahon with bated breath, he announced that the biggest acquisition in the history of the blue brand is... Elias! A chorus of boos was interrupted by Elias as he actually made his way to the ring! The guitar-clad villain didn't get to run down the Montreal folks for a long time though, as Roman Reigns of all people came out to the delight of the crowd! Reigns wasted no time and hit Elias with a Superman Punch. To Vince's surprise, Roman hit one on the boss too. The Big Dog picked up a mic and kept it short: This is his yard now! Reigns prepared to leave but came back for a thunderous Spear on Elias. The crowd popped BIG TIME for Roman Reigns here. He immediately took to Twitter to comment on being "the biggest acquisition in SmackDown Live history". As is usually the case with Roman Reigns, he kept the tweet short and stated that although he has a new yard now, the rules haven't changed one bit. This has indeed been quite possibly the biggest acquisition in the history of the blue show. Keeping Reigns and Rollins on both brands wouldn't have helped matters, and Reigns would have ultimately gotten booed by the fans. Here's hoping Reigns becomes a mainstay on the blue brand for a while and stays away from the Monday night spotlight for a long time to come. 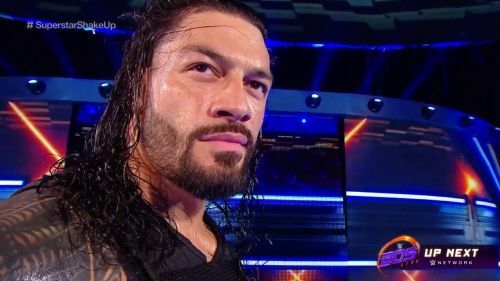 What was your reaction on seeing Roman Reigns come out on SmackDown Live?